Following an invitation from The Poindexter’s Chuck began to stage rehearsals at their home. 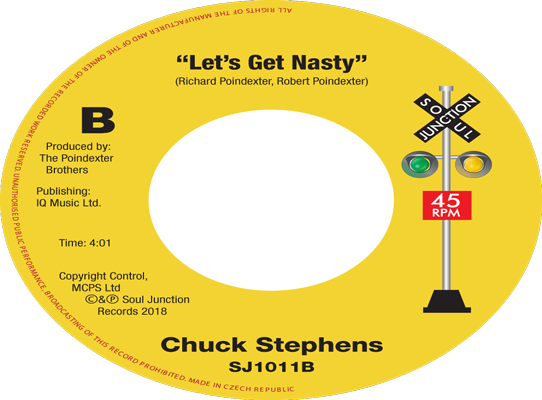 Once the Poindexter’s felt Chuck was ready they took him into the studio to record one of their many compositions, “Let’s Get Nasty. “Let’s Get Nasty” b/w “Girl I Want To Make Love To You” was to gain a release on The East Coast label during 1975. The Poindexter’s then recorded a further two songs on Chuck both Richard and Robert compositions along with a third songwriter Jacqueline Members, who became the wife of Robert Poindexter. The songs in question were the excellent mid tempo outing “Coffee” backed with the sublime and currently in demand modern soul dance track, “(I’m Still) Paying For Your Love” to use its original working title, although the “(I’m Still)” was later omitted from its released title. “Coffee/Paying For Your Love” although being released on the Leo Mini label (LS-110A) during1977 had in fact been recorded within a few months of Chucks “Let’s Get Nasty” release and had remained in the can until the Leo Mini release. Chuck Stephens’s work came to the attention of the UK Rare/Northern Soul scene during 1975 as an import new release 45. When it was picked up and championed by legendary Blackpool Mecca Disc Jockey Colin Curtis firstly mixing it in with other new release and current spins of the day. At the time the Mecca Saturday night soul sessions always finished off with the last record of the night Young-Holt Unlimited’s Brunswick records outing “California Montage” a Dave Grusin penned song that featured as part of the soundtrack of 1969 Paul Newman film “The Winning”.